Discussion in 'Replica Props' started by jason1976, Feb 5, 2006. So, I've was watching SG1, and SG Atlantic, last night, as I do ever Saturday now, and decided that I'm hooked. I used to hate those mini rifle things they ware around, but they've kind of grown on me now. Anyways, I would really like to get an airsoft version of there guns, but I don't know witch one to get. I've seen D9, D-90, D-90 H, D-90 F, some with single, or triple rail, and prices ranging from $20. -$90. What's that correct one for the show? I'm looking to do this cheep, and I don't care if it's 100% accurate, or how well it shots, but I don't want to buy the $90. one, and find out that the $20. one, is closer to the right one, or the other way around. This is the older model and getting harder to find, at least in Tokyo Marui Airsoft form. 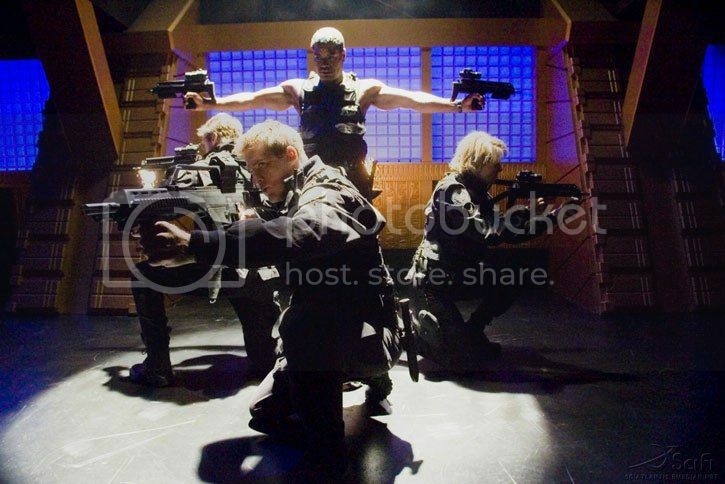 The actual prop on SG1 is a real weapon, firing blanks. The newer version of the gun, the "Tri Rail" or "TR" P90, may be showing up in Atlantis or newer SG1 episodes (according to what I've heard) but I don't think I've spotted it yet. The TR's main difference is that the front part (with the "rails") is lower. Unfortunately most of the cheap replicas are of the TR version, which I've never actually seen on the show. $20? Where exactly can I get one that cheap? You won't get a Marui version for $20, that's for sure. Cheapo Korean knock-offs, sure... Hence the "D-90" confusion. Another major difference between the P-90 and the P-90 TR is that the triple rail version is a different colour/. It's more a kinda beige, whereas the original version is closer to black. $20?Â Where exactly can I get one that cheap? I Have got one of these which I bought for parts for a project, it was so much fun I bought another on to keep. It is not the most powerful airsoft in the world about the same as a murai mini gun, but at about 1/10 the price who can argue. $20?Â Â Where exactly can I get one that cheap? I see the difference now, and I do like the FIN P90 better then the "TR". However, I'm sorry, but there's no way I'm paying $200 - $300 for a funny looking BB gun. I like the show, but I'm not that obsessed...... yet. The $20- $30 one will have to do for now. Do they sell the top part with the rails separately? Maybe I could do some upgrades on the cheepo one. BTW, just search ebay for "D90" or "Stargate D90" for the cheepos. What pistol do they use for their sidearm? The M9 aka M92FS Beretta. You can buy cheap airsofts of them for as little as couple of dollars. Though the cream of the cream for a replica Beretta is one made by Western Arms (these will run you over $150 usually though). For most purposes a cheap gun will do just fine though. Can you ballpark a price? That's great, I'll get the pistol now, and hold off and see what you have later for the P90. When I here that they my have used the TR. in a few episodes I thought I could like with it, but after I tool the time to look at a bunch of promotional pics, for both shows, all see is the FIN, and it is just cooler for some reason. Don't get me wrong, the TR. is a nice gun, I played with one at the Army Navy store yesterday, and it's surprisingly comfortable to hold. I may have to pick up a TR. to play with, but I still would really love to get a FIN. With ballpark as the operative word: Certainly less than what a Tokyo Marui costs (when you can find one), probably about half or so (jason1976 gave a good idea of the Marui costs in his post up above). OK I've found myself a few options as far as the M92FS goes, and a lot of them look almost identical. The only really noticeable difference is that some have a lanyard loop, just behind the cartridge, on the bottom of the handle. So, witch is accurate to the shoe? (With lanyard, or without) Does anyone have clear pics of this gun on the show? I've looked around and haven't found much in the way of pic, but then again, I don't have the show on DVD. I saw one on last week's episode that I couldn't identify. When the SG1 team was fighting aboard Baal's ship, Teal'c was running around with a gun in each hand. Carter might have had one as well. They looked larger than standard pistols. Anyone catch what they were? I'm pretty sure the SMG they used on last week's episode is a Heckler & Koch MP7. It has a retractable stock that was open in the SG1 episode. I saw an inexpensive P-90 airsoft with the higher rail at Academy for under 40.00. Teal'c is wielding two H&K MP7s; Carter and Danial are using them as well (notice Carter using the fold down foregrip). Up front we have a G36KE. OK I've found myself a few options as far as the M92FS goes, and a lot of them look almost identical.Â The only really noticeable difference is that some have a lanyard loop, just behind the cartridge, on the bottom of the handle.Â So, witch is accurate to the shoe?Â (With lanyard, or without) Does anyone have clear pics of this gun on the show?Â I've looked around and haven't found much in the way of pic, but then again, I don't have the show on DVD. Could you expand on this a little. Like is there a web site, or way for use to see, and possibly buy one (or more) of these? I enjoyed seeing the new HK guns on SG1 this past week. I think the G3 was also impressive in the way they used it, and the effectiveness it had in the episode. And watching Teal'c go all john woo with two guns was pretty cool.